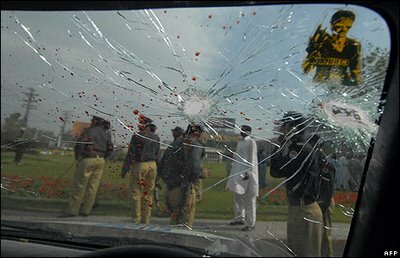 Seven Pakistanis, including six police and the driver of a bus carrying match officials, were killed in Tuesday's attack on the Sri Lankan team as it was being driven to the Gadaffi Stadium for the third day of a match against Pakistan. 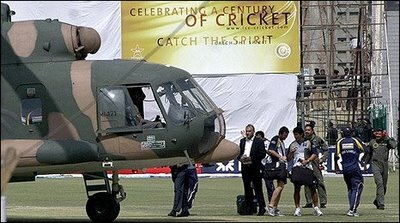 The second Test between Pakistan and Sri Lanka has been called off following the attack on the bus carrying the tourists' team in Lahore. "Cricket in Pakistan is over for some years, I would believe," said former Pakistan captain, Sarfraz Nawaz. Former England cricketer Dominic Cork, who was also caught up in the attacks, called for international cricket to boycott Pakistan. Cork, who was working as a commentator for Pakistan TV, told Sky News: "I don't think international cricket should return to this country. "I won't be coming back here while I'm still living, there is no chance."